The leaders of South and North Korea began their second round of talks Wednesday around 10 a.m. at the Paekhwawon guest house, and they intend to announce the results before their scheduled luncheon, according to Cheong Wa Dae. It is “hard to say” that the two leaders reached any concrete agreements on the main agenda items during their first round of talks, held Tuesday, said Yoon Young-chan, the president’s senior press secretary. The South Korean side had identified the main discussion topics as denuclearization, paving the way for Washington-Pyongyang talks on denuclearization, inter-Korean relations and ways to ease military tensions along the border. “There will be more discussions (on the issues) today,” Yoon said. 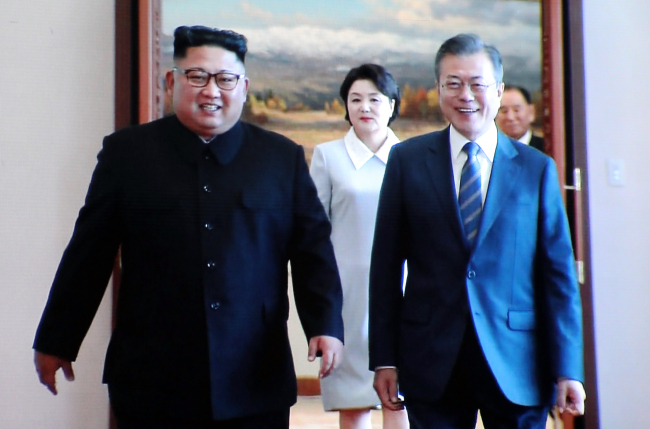 The presidential office also remained mum about an apparent scheduling mix-up that reportedly prevented the leaders of the South’s ruling and opposition parties from meeting with senior North Korean officials. Following the summit, the two sides will have the luncheon at Okryugwan restaurant in Pyongyang. A dinner will be held later at Pyongyang’s Taedonggang Seafood Restaurant. The South Korean president and his entourage will dine in a separate room, while the rest of the restaurant will be open for business as usual for Pyongyang’s citizens, per an earlier request from Moon.